The rise of HD video-capable DSLRs has led to a thriving market for accessories to help the professional or aspiring videographer achieve high quality moving camera shots. Alongside a slew of steady cams and cranes, the portable dolly slider is becoming increasingly popular as a must-have tool for achieving smoother camera moves, and higher production values. 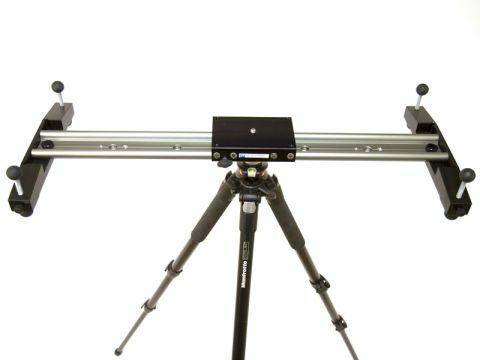 The HD Hybrid Slider fits into the range of Glidetrack sliders - following the Glidetrack HD and Glidetrack Shooter HD - and comes in 0.5 metre, 0.75m, 1m, 1.5m and 2m sizes. We tested the 0.75m model. It offers a robust solution to the problem of camera shake during tracking and crane shots. Despite its apparent similarity to the other models in the series, the Hybrid offers a new carriage design that significantly improves performance, along with a new variable-position foot that enables the carriage and track to be leveled on any terrain. The Glidetrack HD Hybrid Slider uses the same track as the original Glidetrack HD, but improves on the carriage and adds a new foot mechanism. The new carriage design has been developed in partnership with Igus, a specialist in precision-engineered moving part assemblies. The tie-up has paid dividends: the new unit is reported to be up to four times smoother than the previous model, with significantly less friction - all of which leads to a substantially smoother track. The carriage sits on a combination of roller bearings and plastic sleeves that prevent additional weight adding friction, and because they're self-lubricating, there's no need for oil. If the system gets gritty, as ours did when we tested it on a sandy beach, the whole thing can be safely rinsed under a tap and left to dry naturally. In addition to the new carriage, Glidetrack has added a simple adjustable foot mechanism that enables each foot to be positioned individually. The rubber balls at each end of the foot add fantastic grip, enabling the entire slider to be positioned over a door for use as a crane, or even upside-down. The balls themselves mean that no matter what angle the slider is positioned at, the foot will make good contact with the surface it's up against - a simple but clever design. The final new addition is the locking screw on the carriage, which enables you to prevent any movement. Reducing the pressure on this screw enables the carriage to move with more or less force, giving good control on slow tracking shots.